So if you follow me you probably feel like seeing this table is deja vu, because I finished another similar table a month ago. This table set was so much easier because it was built solidly and still in great condition--for the 1990's. Time for the miracle power of paint and stain to enter the picture and bring an outdated, unwanted piece to today's world. Now $100 is more than I like to spend on my pieces to redo, but after making $700 in profit from my last table redo, and recognizing that although this table was smaller with less seating, it also was in much better shape and would thus take me far less time. Plus I knew I had almost all of the supplies on hand already, so I figured the extra cost would pay off just fine. I couldn't decide between two looks I had envisioned in my mind so I asked my Facebook followers..."Which set's "look" do you like best?" I really wish I had the links to each of these tables, but alas I do not. If you're reading this, and you created one of these tables please let me know so I can give you all the credit your beautiful creation deserves! 75% voted for the table on the right, so that is what I set out to do. 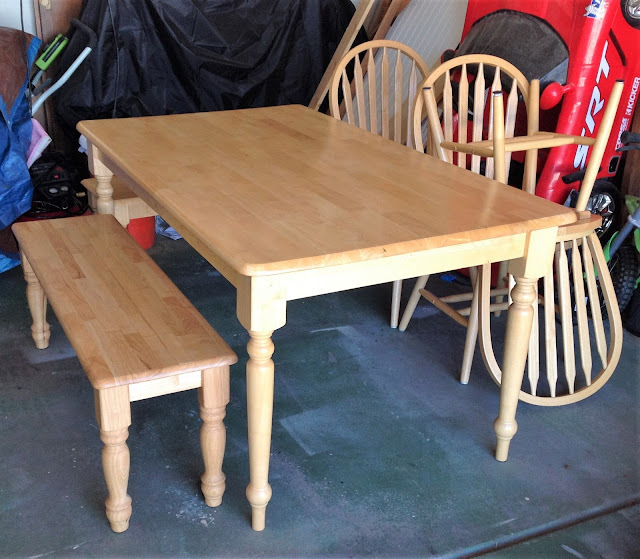 Even though the table on the left would be easier because I wouldn't have to sand down the tops of the benches and table, but just do a few coats of General Finishes gel stain over the tops, I did like the picture on the left a little bit more, and wanted to see if I could do it. So different, I know. Since I am selling it and it looks pretty anyway, I didn't fuss with matching the looks. 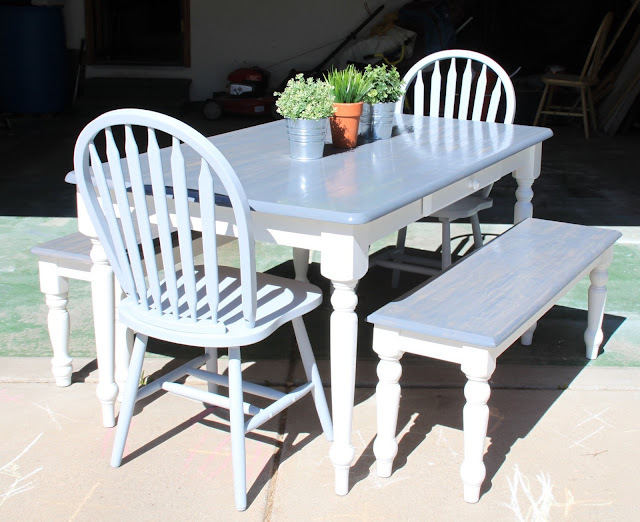 But now I have researched how that look (on the right) was achieved (white wash coat first, brown stain over top, and wipe off), and I will try that on a future table I get. Sand down the tops of the table and benches. I started with my belt sander since I like to results fast, which had 80 grit sandpaper. I then used my hand sander with 100 grit, then 150 then 220 grit. 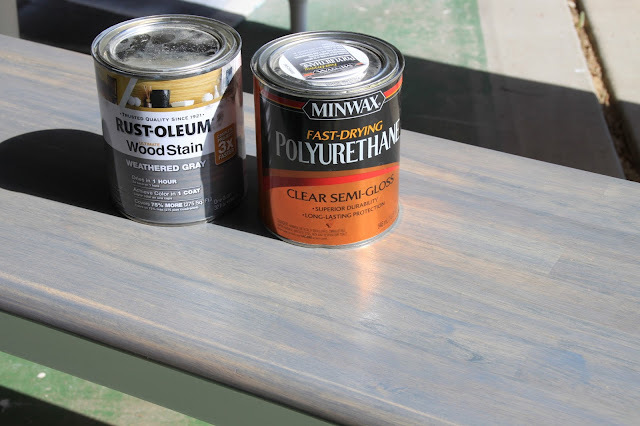 The table's original top coat was officially gone and the wood felt as smooth as butta. I flipped the benches and table upside down (on top of cardboard to protect the smooth, susceptible wood), and taped around the underside of their tops to protect the area that would be stained. I then used my paint sprayer and painted. Can you see the blue tape? I sealed off the edges that would be exposed to the paint. I applied the stain, (followed by 3 coats of polyurethane (using 0000 steel wool in between the 1st and 2nd coats of poly)). I applied 1 coat of stain to the benches, and around 2 coats of stain on the top of the table. I am pretty sure that I didn't get ALL of the original top coat off of the table's top, because the stain didn't soak in to all of the areas equally. Frustrating at first, but then I kind of liked the natural, shabby look this achieved, and went with it. It's art right? (BTW, I did allow for the recommended amount of drying time between the stain and each coats of the poly). And that is it. Not too hard right? It was nice having all of the supplies on hand so that the project really only took me a few days. However, I really do think I want to try the look that my FB fans suggested sometime soon. Also, I'd love to know if you have ever used a gray stain that you really like. Although I like Rustoleum's Weathered Gray stain, I think I would like to try one that has a warmer hue to it. Thanks for reading my latest saga! Sign up to follow each of my sagas there on the right side of the page. You got it! Now you can have a whole lotta fun just emailed to you ;). Mimi, I love what you do. Its gorgeous! I did things like this in my youth (by the way your reference to the 90's cracks me up, I'm 60 haha) but the painted surfaces always scratched very easily. And on a kitchen table and chairs, I would think that would be a bad thing. I would like to redo our old dresser (OMG its really old, its from the 80s :) )in to a buffet for the kitchen, then find a table and chairs to do to match. I would like to paint it red and white. Don't care if its in style old enough to do what I want. But it worries me that after a couple of months it will be all scratched up. Do you have this problem? Karen your comment cracks me up too! Thank you so much for following what I do :). So I totally know what you mean about the scratching up factor. In fact, just this last week I was noticing that a dresser in my boys room and the chair that goes with their desk both need some paint touch ups. Ugh. However, they have had both for awhile and thus have held up to abuse from four little boys for quite some time. 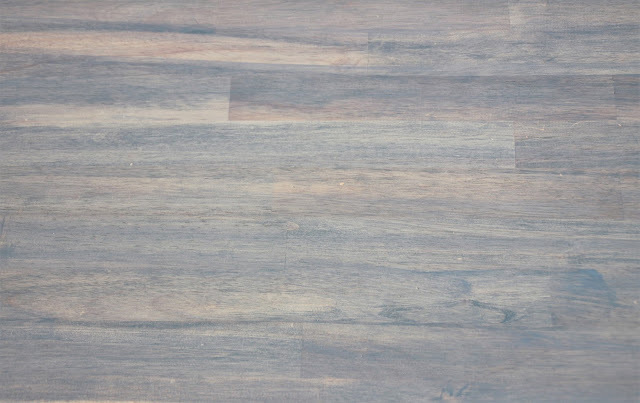 Now when it comes to table tops I like to go with a stain and then several layers of polyurethane since that is more durable and won't chip. For the chair seats I would even contemplate going with a stain to match the table top. Then because it is a lot easier, and I like the two tone look, I paint the legs of the table and chairs. 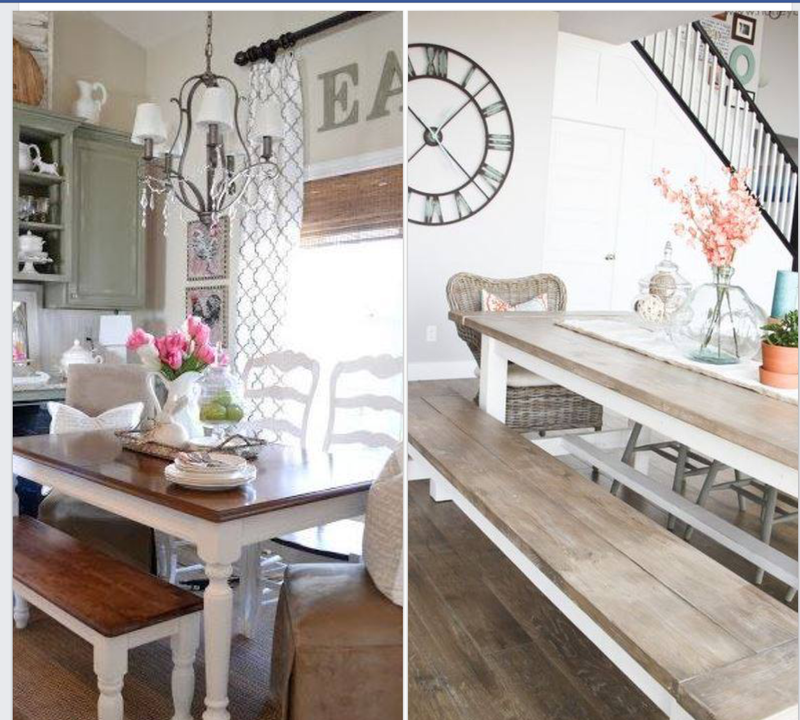 Thankfully the chip/distressed look is in...shabby chic am I right? :) But sometimes you don't want that look, and eventually there will be some chipping. In all fairness though, the Cost Plus World Market table our family bought years ago, which is an espresso STAIN, has a ton of wear and tear and areas needing touch up as well. 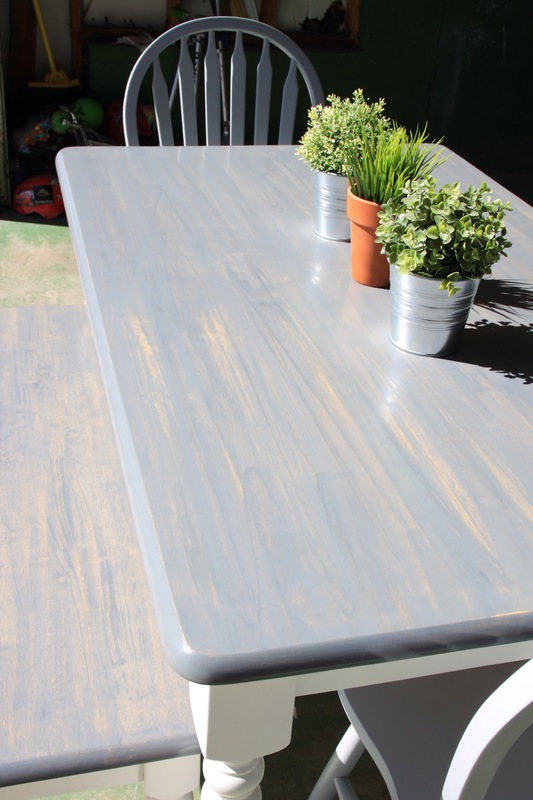 Now if you are set on doing the table top surface in a paint, make sure you use several layers of polycrylic on top. You could also spray the legs of the table, and all over the chairs with polycrylic too for that added layer of protection. I hope my rambling helps! Good luck!